Outdoor Father’s Day Gift Ideas for Dad - Legends Landscape Supply Inc.
Are you thinking of getting Dad another necktie for Father’s Day this year? If Dad loves spending time outside, then why not get him an outdoor gift that he’ll love. And not just on Father’s Day – but every day too. Don’t venture out to the mall or department store this year. Instead, head on down to Legends Landscape Supply Inc. to give Dad a Father’s Day gift that’s truly a breath of fresh air. It’s for Dad, after all. No, this does not mean you’re giving Dad a pile of dirt for Father’s Day (for more info, read our blog about the difference between dirt and top soil). If he’s an avid gardener, you’ll be giving him the foundation he needs to plant and grow a thriving garden during the spring and summer. Triple mix soil is a practical and useful gift because it contains all the good stuff a garden needs to grow (like coarse and find sand, clay, silt and organic matter). High-quality loam isn’t always readily found in the garden. But you can find it at Legends Landscape Supply Inc. and give it as a helpful Father’s Day gift this year. Dad will absolutely love to show off his new fire table to all his buddies. Is Dad the “King of the Grill?” But is his BBQ or smoker more rusty than royal? 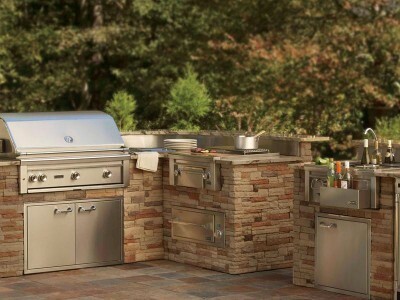 Give Dad a barbeque that he’ll want to fire up as often as possible – and which will also last for many years to come. And if Dad’s the type of guy who likes to put things together himself, you can give him a do-it-yourself BBQ kit that he can build himself and place in just about any location in the backyard. Happy Father’s Day from Legends Landscape Supply Inc.
To all the Dads out there, we want to wish you a Happy Father’s Day. And we want to say thank you – for all that you do. This year, make Father’s Day truly unique by giving him outdoor-themed gifts that he’ll enjoy. Not just on Father’s Day – but every day too. Unsure where to start? Contact us at Legends Landscape Supply Inc. today and let us know what you have in mind for Dad. We’re certain to have the right outdoor gift for you to give this year. Written on Monday, June 22, 2015.